I searched in my log but on this date i don't have any QSO's. Re: Clublog - upload problem. what version are you using? This bug was fixed in 1.7.2. I used 1.7.1, but my synaptic don't see new version. I installed "by hand" and now all is ok.
SyncUpdate:SyncMsg :ClubLog: Deleting original SN1WOSPselect * from log_changes where id = 57data.Text:email=xxxxxxxxxxxxxxxxxpassword=xxxxxxxxxxxxcallsign=sq2ombapi=21507885dece41ca049fec7fe02a813f2105aff2dxcall= SN1WOSPdatetime=2014-01-12 14:15:00bandid=40Response :Invalid DX CallResultCode:403SyncUpdate:SyncMsg :ClubLog: Could not delete original QSO data! Application use correct DXCC like SP (Poland). I saw that on the log i had save " SN1WOSP". 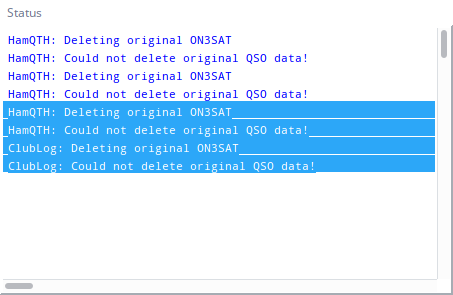 I corrected it and now i have "SN1WOSP" but program say "ClubLog: Deleting original SN1WOSP", "ClubLog: Could not delete original QSO data!" you have to upload all QSO again with ADIF file. The bug caused that the your log at ClubLog won't be consistent. I'm sorry for inconveneice. What distro are you using? New version should appear in updates. Hi Petr, sorry for late. I uploaded adif on clublog website. I cleared my log first and i can't upload changes. SyncUpdate:SyncMsg :ClubLog: Deleting original SN1WOSPselect * from log_changes where id = 57data.Text:email=xxxxxxxxxxxxxxxxxpassword=xxxxxxxxxxxxxxxxxxxxxxcallsign=sq2ombapi=21507885dece41ca049fec7fe02a813f2105aff2dxcall= SN1WOSPdatetime=2014-01-12 14:15:00bandid=40Response :Invalid DX CallResultCode:403SyncUpdate:SyncMsg :ClubLog: Could not delete original QSO data! You have all the logs sent - yes? 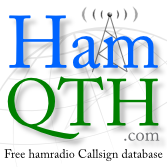 ClubLog: Could not delete original QSO data! Of course you can deal with it by doing the manual update. But it happens to me too often. this is really a problem and I'm not sure how to solve it. I already have an idea but don't know it it will work. The fix should be in next version. I have similar problems like in this topic. When I try to upload I get this. Do you have any idea? go ok. Done now couple of times with no troubles. I Have the same problem. is there a fix to this ? Same problem. Cant upload log in Clublog.